© 2002, © 2019 by Paul Freeman. Revised 1/22/19. 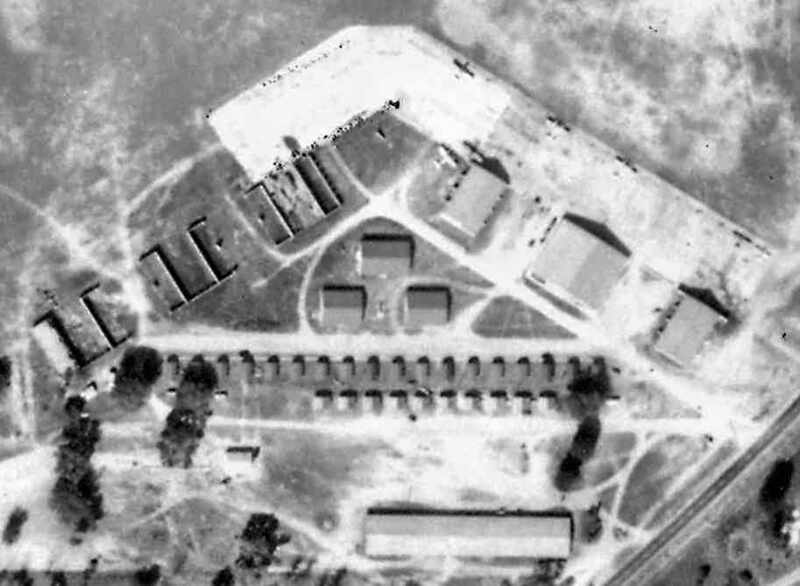 An August 1943 aerial photo of Belmore NOLF (from the University of Florida Online Library, courtesy of Chris Kennedy). 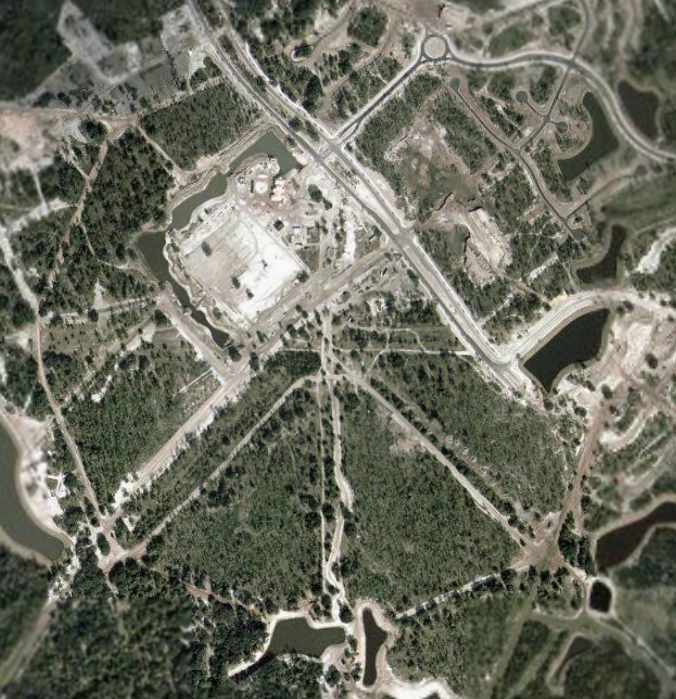 This former military airfield was one of a large number of satellite airfields used during WW2 by NAS Jacksonville. The dates of use of Belmore NOLF are unknown. 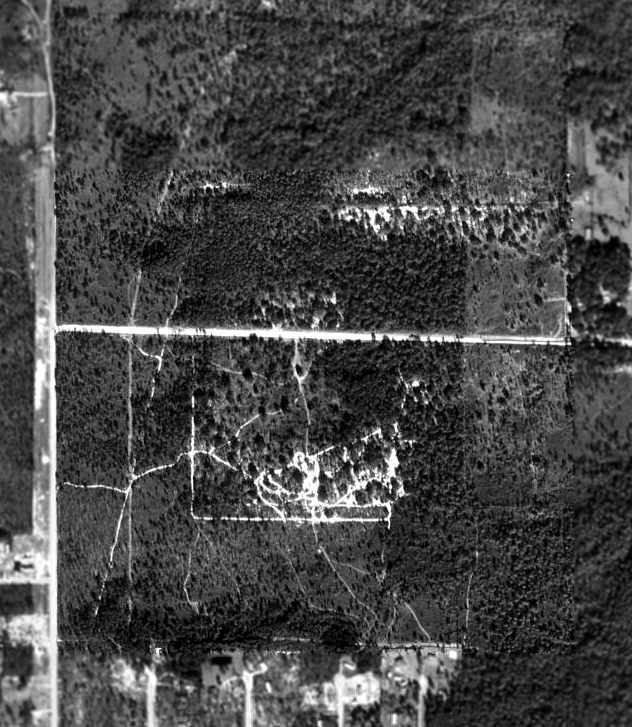 was on the above August 1943 aerial photo (from the University of Florida Online Library, courtesy of Chris Kennedy). It depicted Belmore as a grass field, similar in shape to a baseball diamond. No hangars or aircraft were visible on the field in the photo. as of April 1944 Belmore OLF was assigned to NAAS Green Cove Springs for Maintenance purposes. or the February 1944 Orlando Sectional Chart (according to Chris Kennedy). was on the July 1944 Jacksonville Sectional Chart (courtesy of Chris Kennedy). was on the February 1945 Orlando Sectional Chart (courtesy of Chris Kennedy). According WW2-era Navy memos (via Brian Rehwinkel), Belmore was not being used by late 1945. 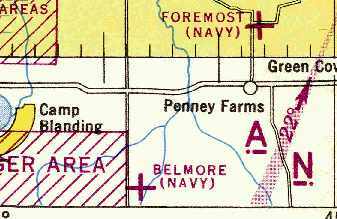 Belmore was a Navy owned field & was declared "surplus-retained". 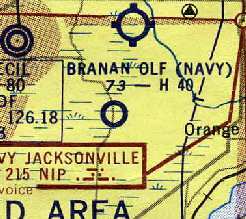 The Belmore airfield was no longer depicted on the August 1946 Jacksonville Sectional Chart. as late as February 1947 (assigned to NAS Jacksonville), but it was described as being "not in use". 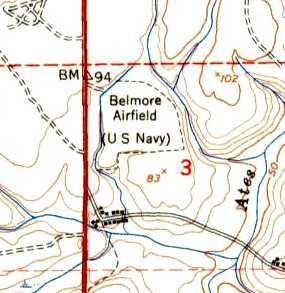 The 1949 USGS topo map still depicted “Belmore Airfield (U.S. Navy)”, but the field was evidently closed by this point. Belmore evidently was never reused as a civilian airfield, as it was never again depicted on subsequent aeronautical charts. 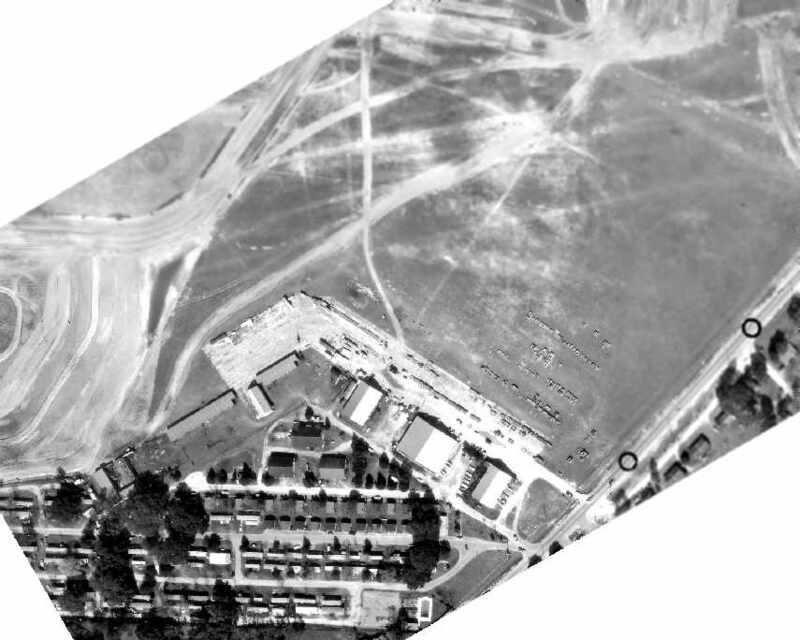 The airfield outline was annotated over the photo by Chris Kennedy. A 10/1/42 aerial view of Branan Field in its original (grass runway) configuration (U.S. Navy photo from the National Archives via Brian Rehwinkel). This abandoned field is located only 3 miles southeast of Cecil Field, on Branan Field Road. 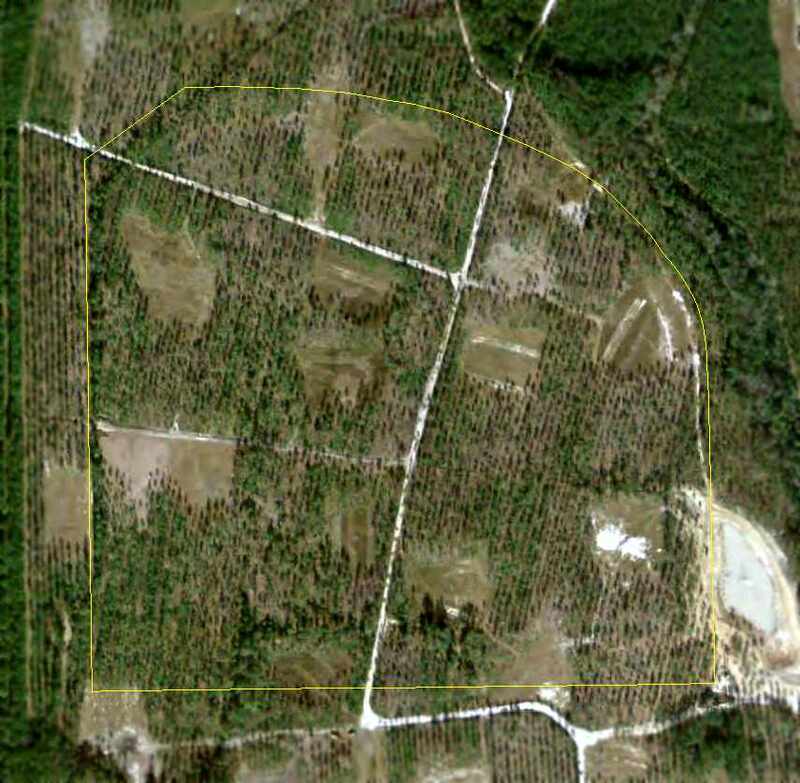 Alvord & Mary Branan acquired this property in 1940.
the Department of the Navy began identifying parcels of land suitable for use in support of NAS Jacksonville. which stood northwest of the Branan's property. 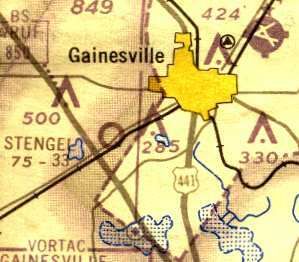 as a suitable outlying field for NAS Jacksonville. The Federal government instituted proceedings against the Branan's real estate in the same year. 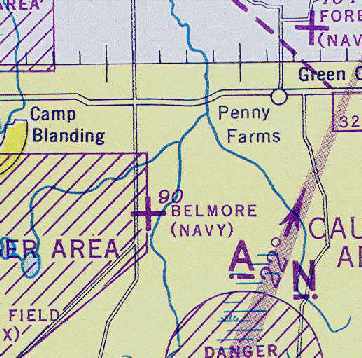 In 1941, Angas supplied the Department of the Navy with preliminary plans for "Outlying Field L,"
or "Branan Field", indicating that the property then consisted of an "improved farm" maintained by A. W. Branan. No airfield at Branan was yet depicted on the June 1942 17M Regional Aeronautical Chart (courtesy of Chris Kennedy). 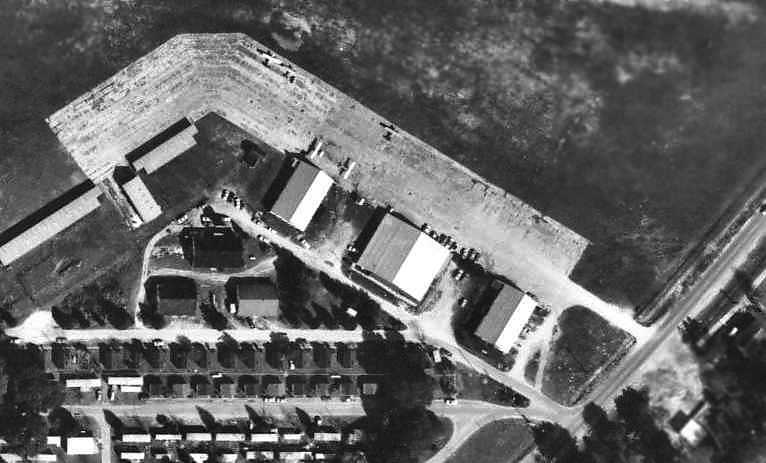 The earliest photo which has been located of Branan Field was a 10/1/42 aerial view (U.S. Navy photo from the National Archives via Brian Rehwinkel). 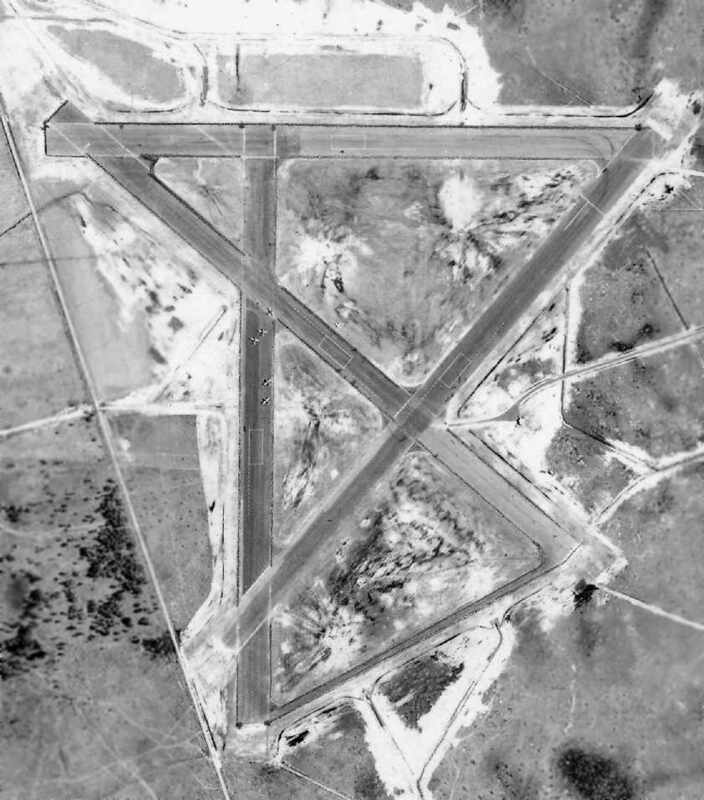 It depicted Branan Field in its original configuration, with 4 grass runways, with a circular airfield marking at the intersection. There were not any buildings at the airfield. According to Brian Rehwinkel, “Because of the changing demands for training…and the change in mission for NAS Jacksonville, the training fields changed as well. The grass field was used by the primary training aircraft until the station’s mission changed & the hard-surface runways were added in mid-1943. depicted Branan Field as the runways were being paved. and construction trucks were visible in the northwest portion of the field. which all intersected at the same point, with the ends of the runways ringed by a taxiway. Brian Rehwinkel observed, “You can see the original field on the left side the new field. was used as the Spencer Bomb Target, perhaps for dive bombers. showed the target to consist of a cleared rectangular area, with a simple small circle in the middle. was on the August 1943 17M Regional Aeronautical Chart (courtesy of Chris Kennedy). 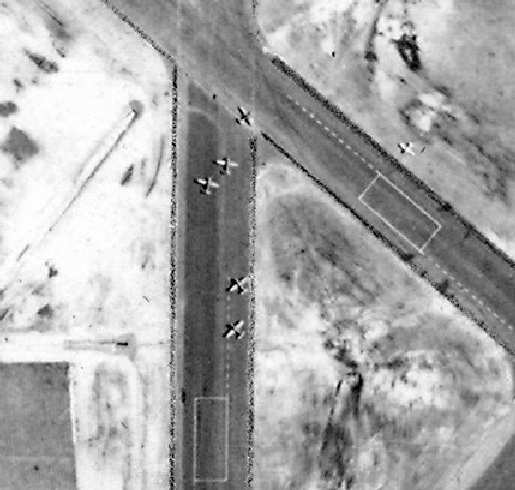 A 1/5/44 aerial photo (U.S. Navy photo from the National Archives via Brian Rehwinkel) depicted painted lines in rectangular shapes near the ends of each runway. a technique also employed at neighboring OLF Switzerland. No buildings were depicted at the site in WW2-era photographs. of Douglas SBD-4 Dauntless & Curtis SB2C Helldiver aircraft in 1944-1946.
later to be known as the "Blue Angels". most of the preliminary training was done at Branan in private. by pilots approaching a single central spot from various compass points in jet aircraft. and depicted as having a 4,000' hard-surface runway. 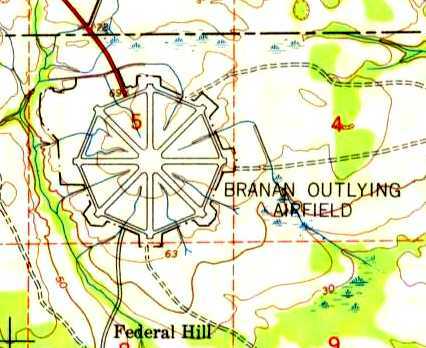 The 1949 USGS topo map labeled the property as “Branan Outlying Airfield”. Branan Field was abandoned at an unknown point after 1949. 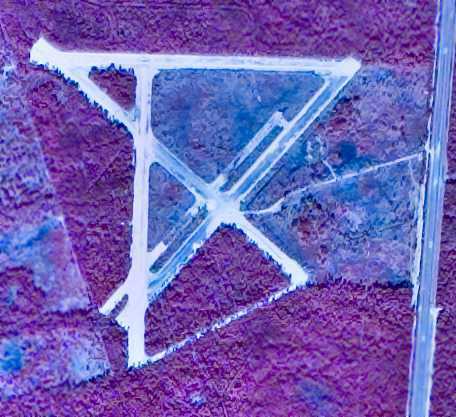 According to Brian Rehwinkel, “Branan OLF has its asphalt removed in 1953 for use in the conversion of nearby Cecil Field to a Master Jet Base. although the octagonal shape was still apparent. into an enhanced bull's-eye with directional arrows pointing east & north. depicted "Branan OLF (Navy)" as having a 4,000' hard-surface runway. However, the remarks in the Aerodromes table said "Closed to all aircraft. Leased for grazing." Branan Field was labeled "Abandoned airport" on the 1964 Jacksonville Sectional Chart (courtesy of John Voss). but that the runways had been eliminated. and an unimproved road extended southward to the bombing range. and imagine that it was a UFO landing site, a Secret Government base & other mysterious things! Cecil Field was still in use then but no bombing or other military use happened at Branan Field when we were there. there wasn't much left by then but the wide, cleared landing strips & crumbling tarmac." but the site was unlabeled. 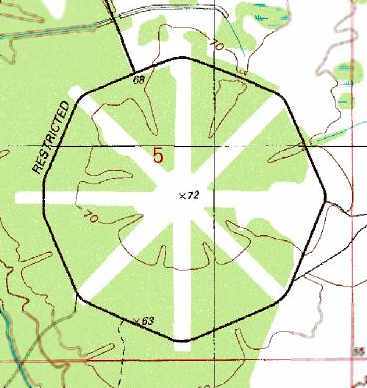 The airfield at was no longer depicted at all (even as an abandoned airfield) on 1990s aeronautical charts. although trees had grown up through several of them. 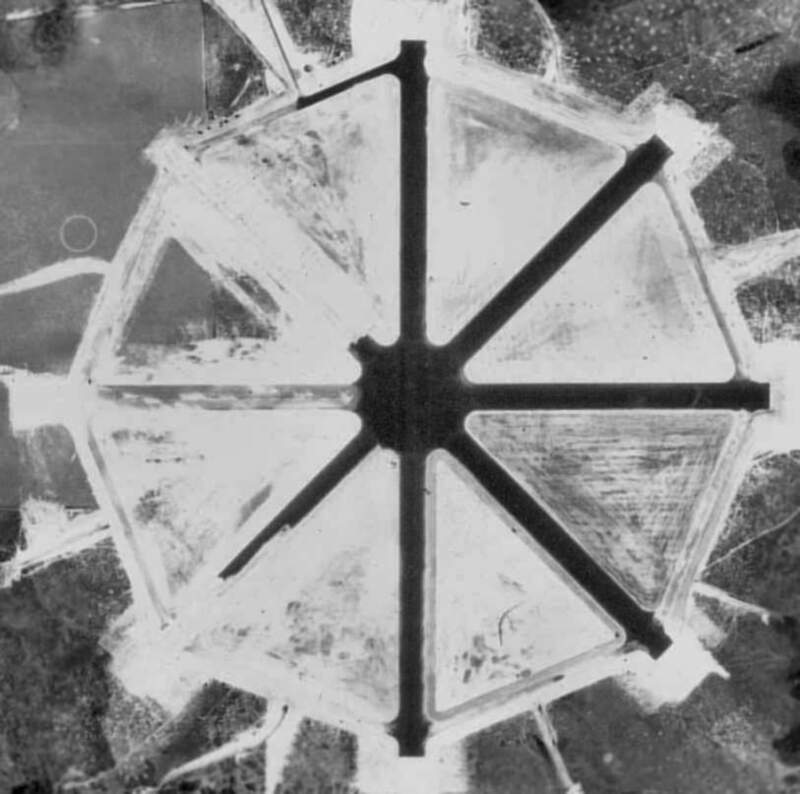 being very similar to its rectangular layout as seen in the 1943 aerial photo. so the remains of the airfield might not last must longer. According to Ray (a Comair pilot), a visit to the site in 2002 confirmed that it looks nothing like an airport anymore. The land is currently owned by a gentleman that has a hunting club on the grounds. although trees have grown up all throughout the area. According to Myles Bland, "The airfield was built over in 2002 & 2003.
but pleased that it was properly documented before-hand. The site of the former airfield "is now a very nice subdivision". much still remained of the numerous runways. with not a trace remaining of the Navy airfield. Thanks to Ed Hines for pointing out this airfield. 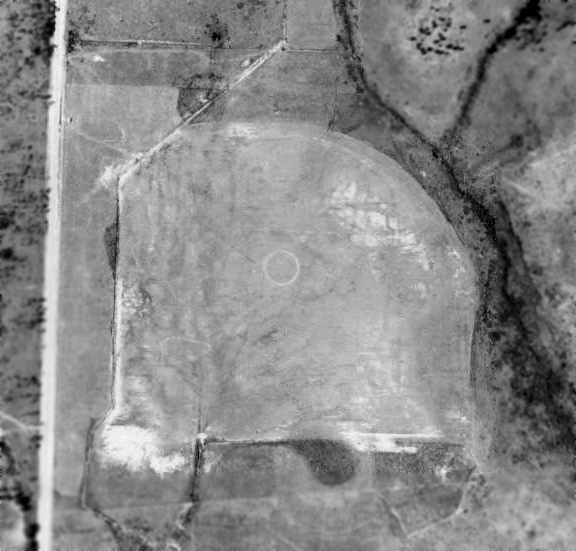 Stengel Field, as depicted on a 3/8/43 aerial view looking north (courtesy of Brian Rehwinkel). 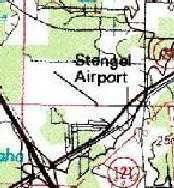 Stengel Airport is yet another general aviation airport which has completely disappeared due to urban sprawl. Carl Stengel bought his first plane in 1930, long before most people even imagined getting into one. 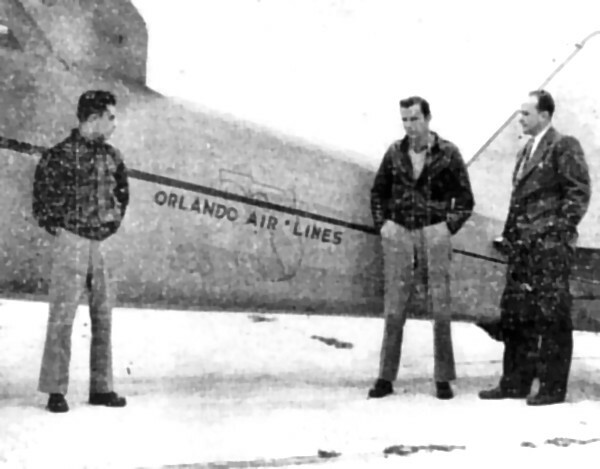 He had operated Stengel's Flying School starting in the late 1930s from the Gainesville Municipal Airport. 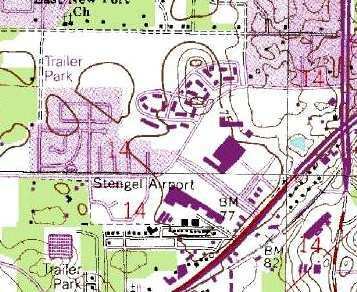 Stengel moved to his operations to Stengel Field, located on Archer Road. nor depicted on the January or July 1942 Orlando Sectional Charts (according to Chris Kennedy). The earliest depiction which has been located of Stengel Field was a 3/8/43 aerial view looking north (courtesy of Brian Rehwinkel). It depicted Stengel Field as an irregularly-shaped grass airfield, with 3 hangars & several smaller buildings on the southeast side. Brian Rehwinkel observed, “This is interesting because there are planes present at the field at a time when many other civilian fields were closed. 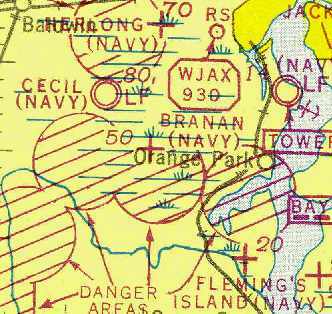 The earliest aeronautical chart depiction which has been located of Stengel Field was on the July 1943 Orlando Sectional Chart (courtesy of Chris Kennedy). showing over a dozen of what appear to be Civilian Flight Training program aircraft. along with what appear to be another set of 3 unfinished hangars on the west side of the ramp. described Stengel as having a 3,800' sod runway. A 1945 photo of the beginning of regularly-scheduled airline service into Gainesville at Stengel Field. Jack Frierson (Stengel Field operator), and Don Dobbins (field business manager). and listed the operator as Don Dobbins. following WW2, faculty apartments were constructed at the Stengel Air Field & managed by the University. 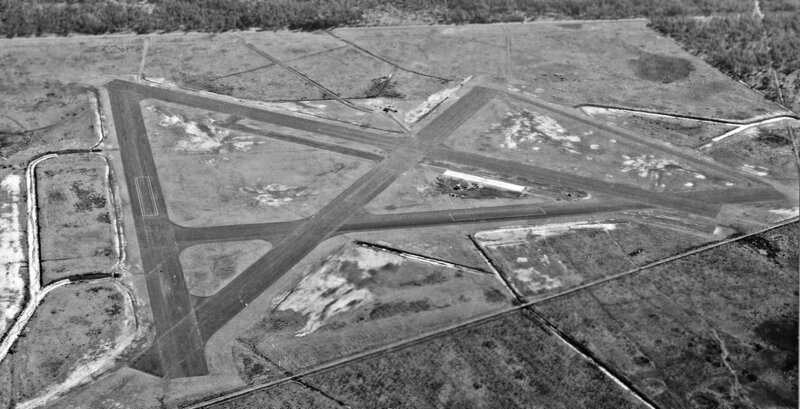 A February 1949 aerial photo of Stengel Airport, from the FL DOT (courtesy of Brian Rehwinkel). The airfield consisted of an open grass area, with a single east/west runway. 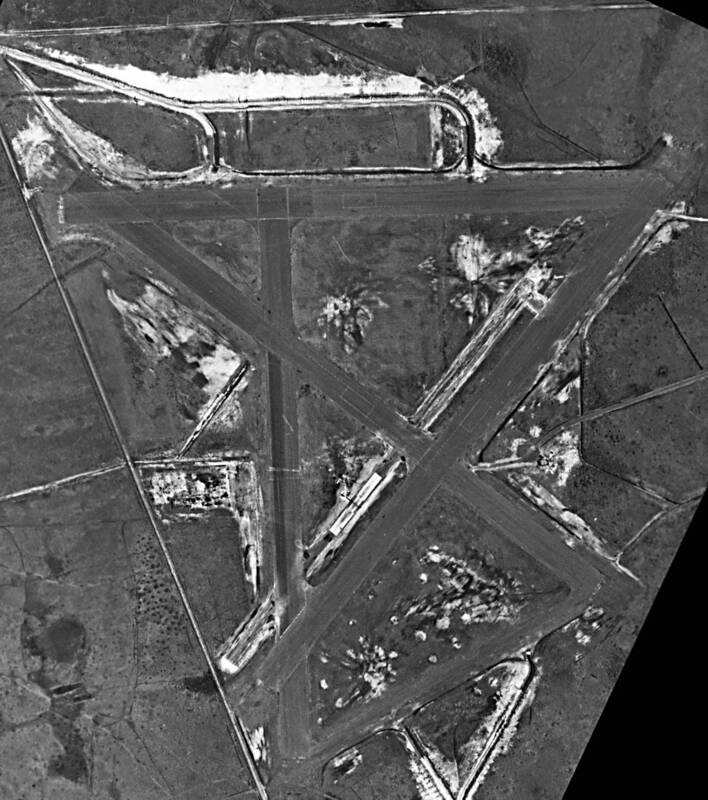 A closeup of the ramp of from the 1949 aerial photo of Stengel Airport, from the FL DOT (courtesy of Brian Rehwinkel). while on the west side of the ramp had the uncompleted set of another 3 hangars. A total of 6 aircraft were visible on the ramp. Bob Jamieson recalled, “Stengel Field [had] a single grass runway of about 3,000'. The Triangle Flying Club was based there. but described the field as unattended. as having a 3,300' unpaved runway. with taxiways leading to a ramp with several buildings on the south side. of Stengel Airport in its final year of operation. 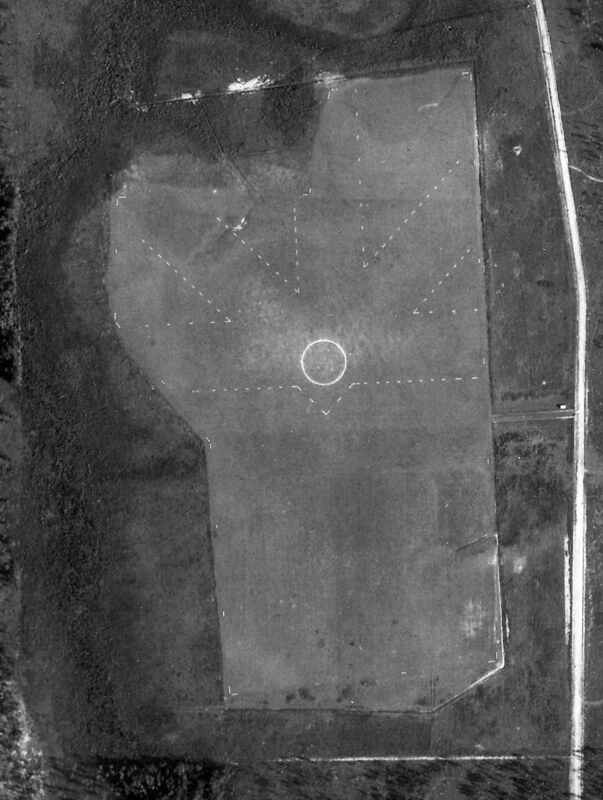 Note that the orientation of the single grass runway appeared to have changed somewhat, compared to the 1949 aerial photo. from the January 1971 USDA aerial photo (from the University of Florida Online Library, courtesy of Brian Rehwinkel). as it was not listed among active airports in the 1/15/72 Flight Guide (according to Chris Kennedy). being used to convert the airport site into a residential and commercial development. "Apparently, no time was wasted after the airport closed in transforming the site." 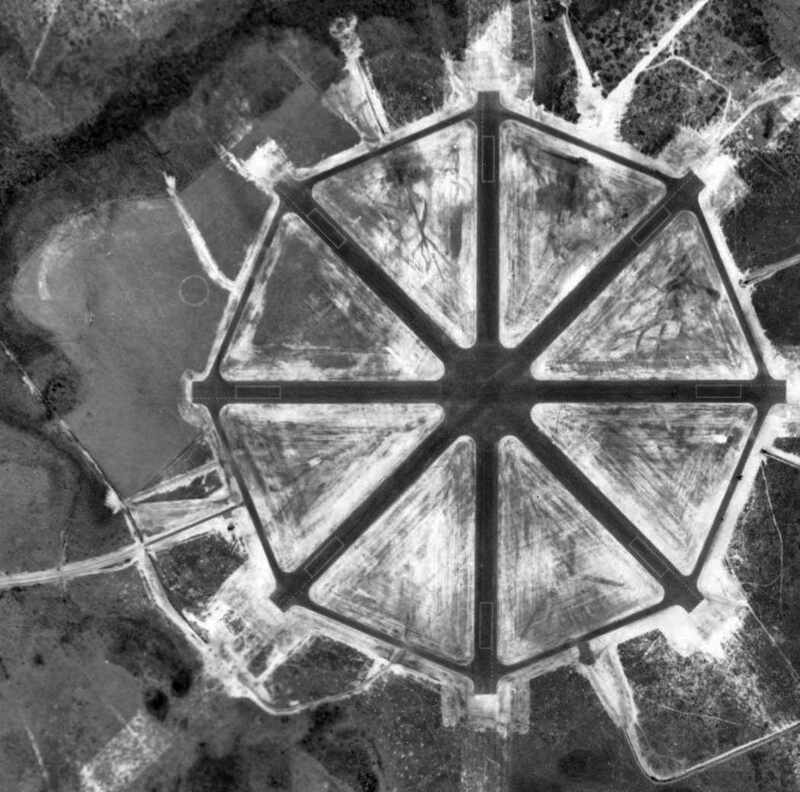 The 3 Stengel Field hangars still remained standing on the 2/4/74 USDA aerial photo (courtesy of Dallam Oliver-Lee). The 11/13/77 USDA aerial photo (courtesy of Dallam Oliver-Lee) showed that the hangars had been removed, replaced by a shopping center. The site of the former Stengel Airport was redeveloped as the Butler Plaza & Archer Square Shopping Centers. and I had no idea there was ever an airport there." even though it had apparently been redeveloped several years before then. The field was depicted as having a single northwest/southeast runway. even though it also depicted that the site had been completely redeveloped with shopping centers & a trailer park. 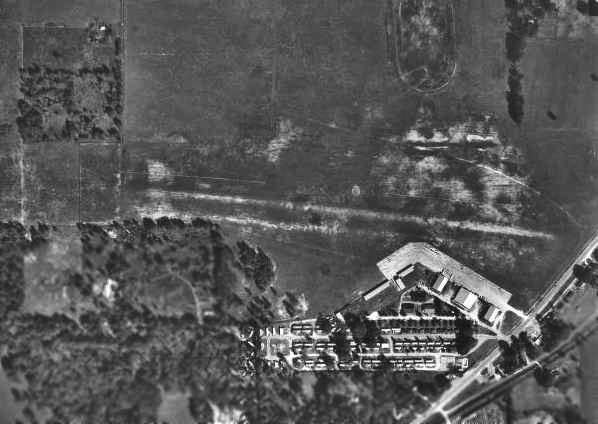 A 1/18/12 aerial photo showed not a trace remained of Stengel Airport, it having been replaced by Butler Plaza & houses. The site of Stengel Airport is located on the northwest corner of Southwest 34th Street & Archer Road. 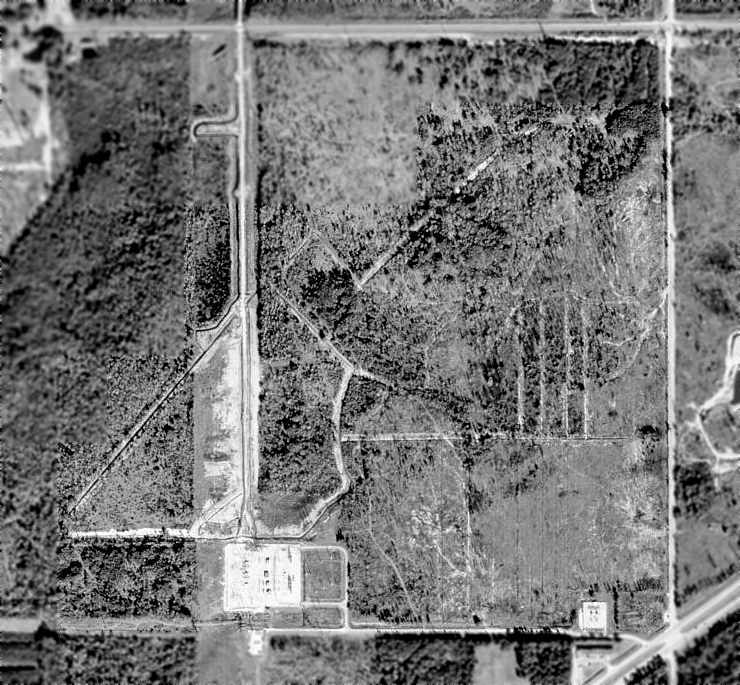 A 1943 aerial photo of Foremost NOLF (from the FL DOT, courtesy of Brian Rehwinkel). but it even depicts 2 aircraft in flight over the field (one at bottom-left, the other at top-right). as one of the many satellite airfields used to support Navy flight training in the Jacksonville area. The date of construction of the Foremost airfield has not been determined. 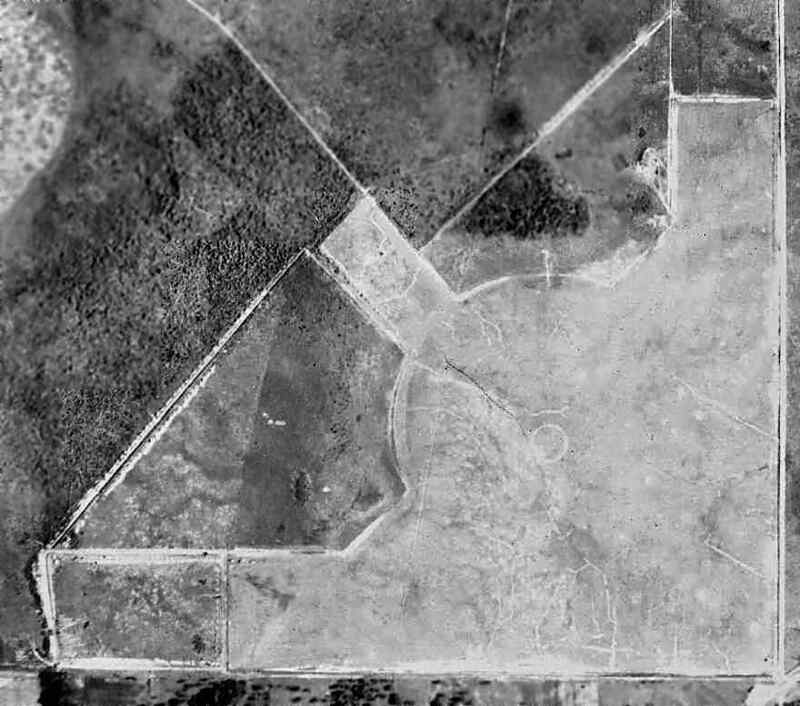 was the above 1943 aerial photo of Foremost NOLF (from the FL DOT, courtesy of Brian Rehwinkel). It depicted the airfield at Foremost as consisting of a 2,600' square grass all-way landing field. along with what may have been a group of small buildings (farm houses?). 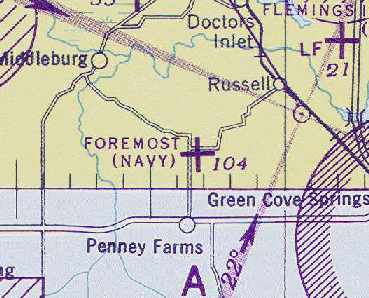 No airfield at Foremost was yet depicted on the January 1944 Jacksonville Sectional Chart (courtesy of Chris Kennedy). 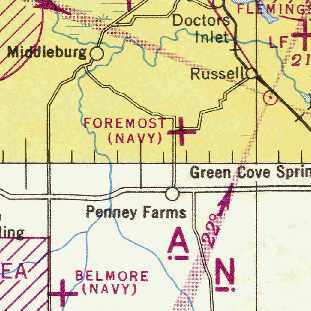 an outlying field assigned to NAAS Green Cove Springs (located a few miles to the east). presumably due to its status as a relatively small airfield. It depicted “Foremost (Navy)” as an auxiliary airfield. was on the February 1945 Jacksonville Sectional Chart (courtesy of Chris Kennedy). and by November 1945, it had been declared surplus property." 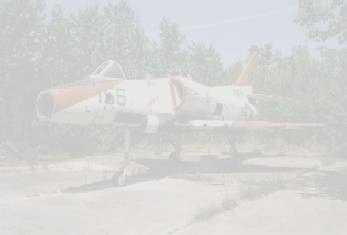 Foremost was no longer depicted at all (not even as an abandoned airfield). even though the field was evidently already closed by that point. 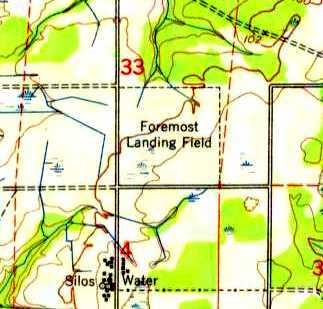 It was still labeled as “Foremost Airfield” on the 1972 USGS topo map. The 1978 USGS topo map still depicted the square clear area, but it was no longer labeled at all. 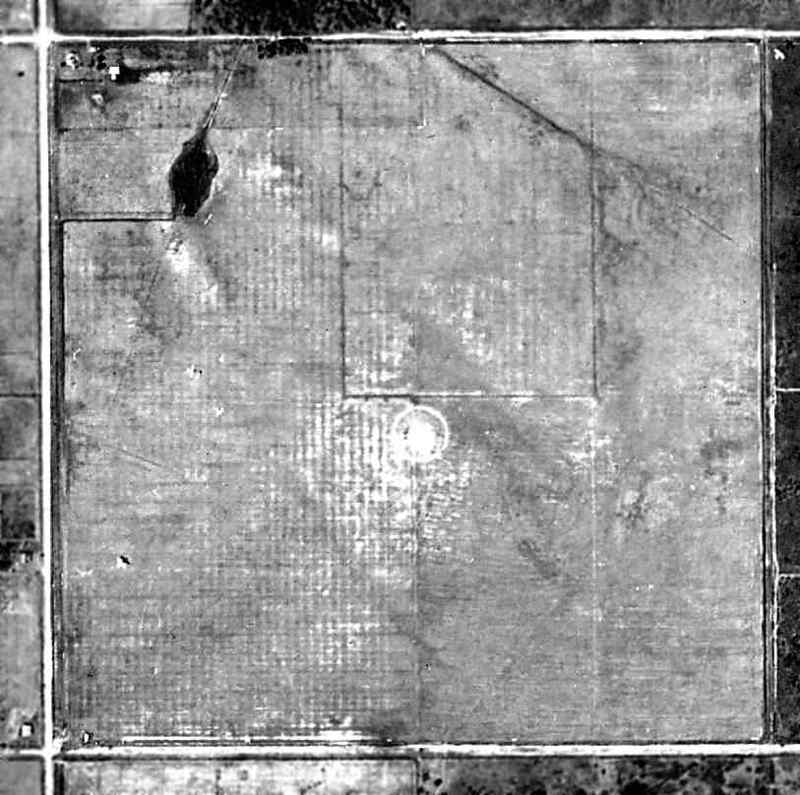 A 1994 USGS aerial view showed the square airfield property outline was still recognizable, but the property was overgrown. 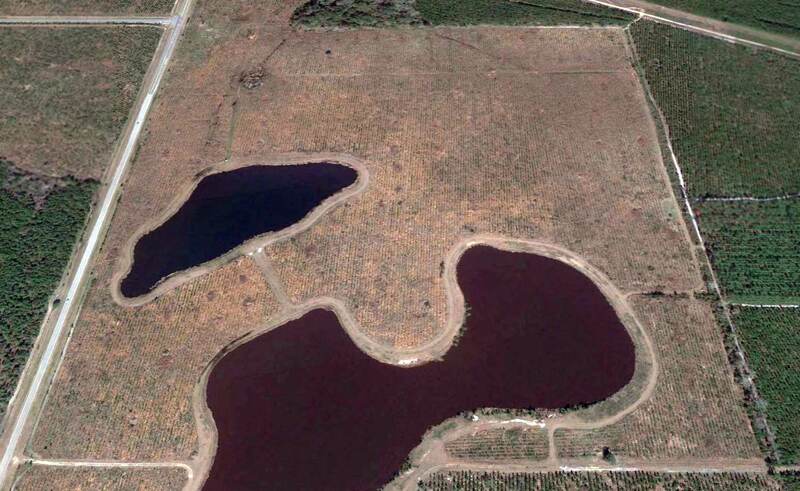 but 2 ponds had been created on the southern half of the airfield site. 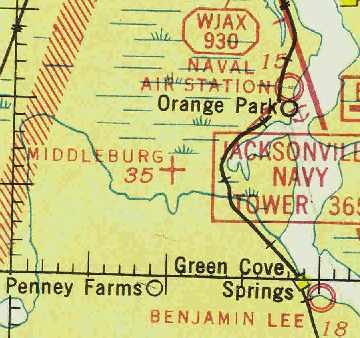 Middleburg Airport, as depicted on the August 1941 Jacksonville Sectional Chart. as it was not yet depicted on the August 1935 Jacksonville Sectional Chart. It described Middleburg as an auxiliary airfield, located 2 miles northeast of the town of Middleburg. The field was described as having 2 sod runways, in an “L” shape, measuring 2,500' north/south & east/west. was on the August 1941 Jacksonville Sectional Chart. 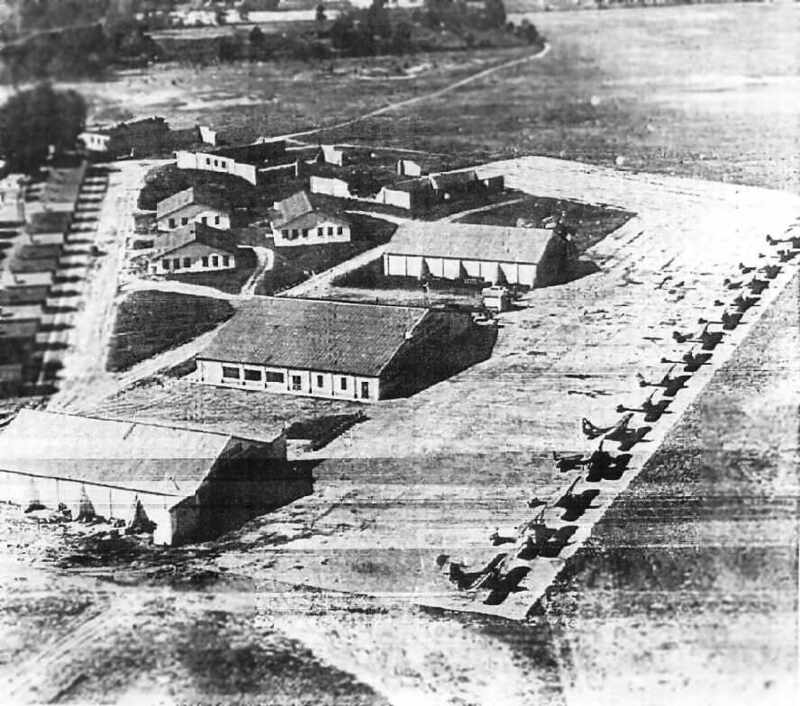 It depicted Middleburg as an auxiliary airfield. 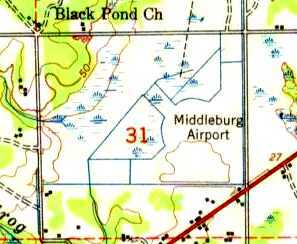 depicted Middleburg Airport as an auxiliary airfield. as it was no longer depicted at all on the August 1943 17M Regional Aeronautical Chart (courtesy of Chris Kennedy). was the 1943 aerial photo (from the FL DOT, courtesy of Brian Rehwinkel). It depicted Middleburg as having 3 grass runways. No aircraft or buildings were depicted at the airfield. 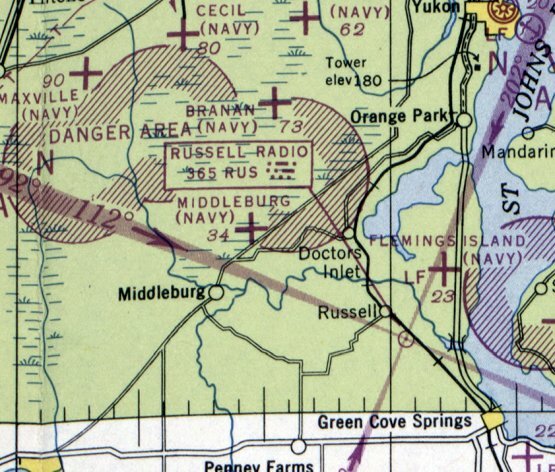 No airfield at Middleburg was depicted on the January 1944 Jacksonville Sectional Chart (courtesy of Chris Kennedy). described "Middlebrurg, Navy" as having a 3,500' unpaved runway. on the July 1944 Jacksonville Sectional Chart (courtesy of Chris Kennedy). and described the field as having a 3,200' runway. Middleburg was listed as being 'inactive' by 1945." was on the August 1946 Jacksonville Sectional Chart. Middleburg no longer showed up on the property list for NAS Jacksonville by June 1948." Middleburg was no longer depicted at all (not even as an abandoned airfield). 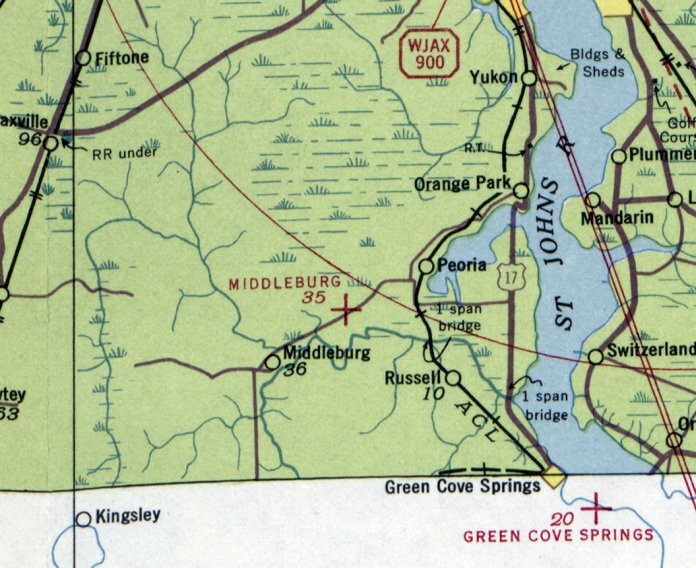 The 1949 USGS topo map still depicted the “Middleburg Airport”, but the field was evidently closed by this point. Nothing at the site was depicted on USGS topo maps from 1981 or 1993.
with the distinctive outline of the 3 former runways still recognizable. with a new road cutting north/south along the western edge of the former airfield. and the site soon be home to a new Super Wal-Mart." 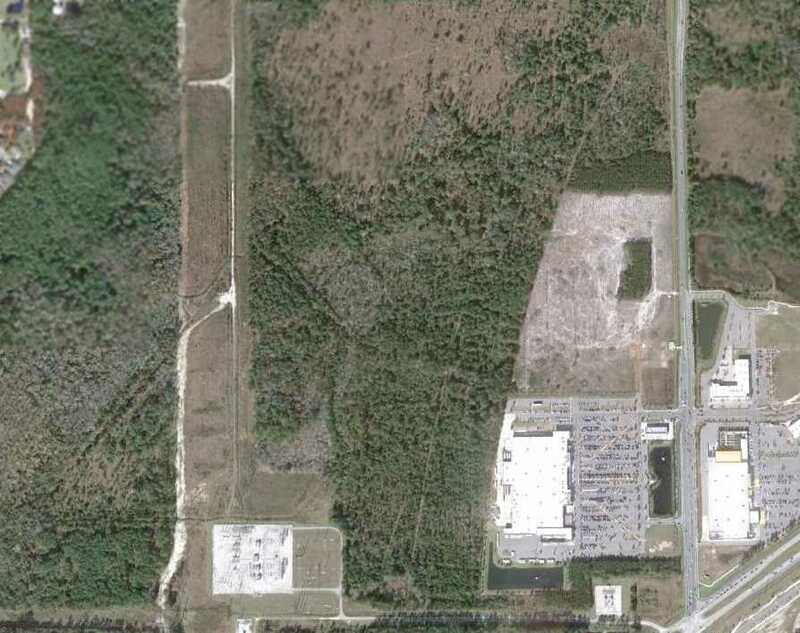 A 12/17/11 aerial photo shows the Wal-Mart which was constructed over the southeast corner of the Middleburg NOLF site. Amazingly though, a careful examination will show that the outline of the airfield is still recognizable in the center & southwestern portions of the airfield site. A 7/14/42 USN aerial view of Fleming's Island NOLF (from the National Archives, courtesy of Brian Rehwinkel). 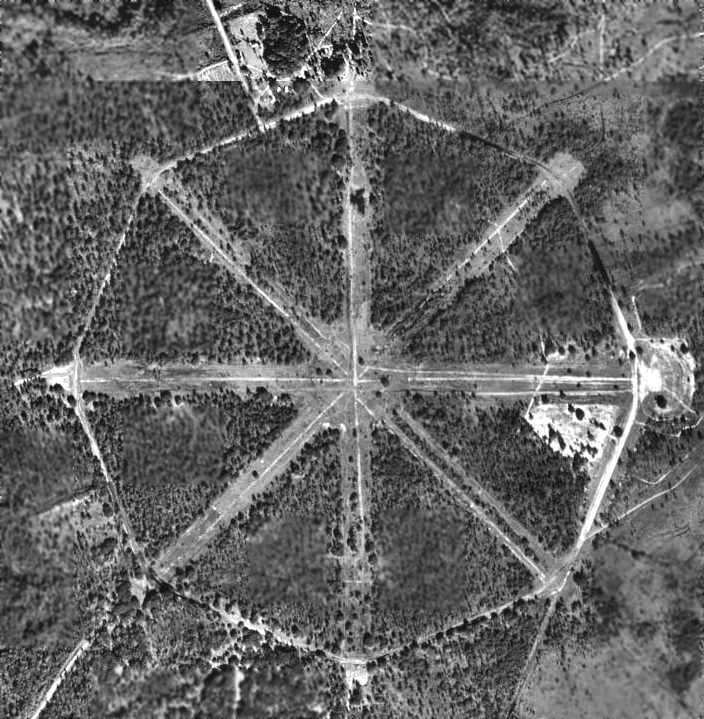 This WW2-era military airfield was built as a satellite airfield for Jacksonville NAS. 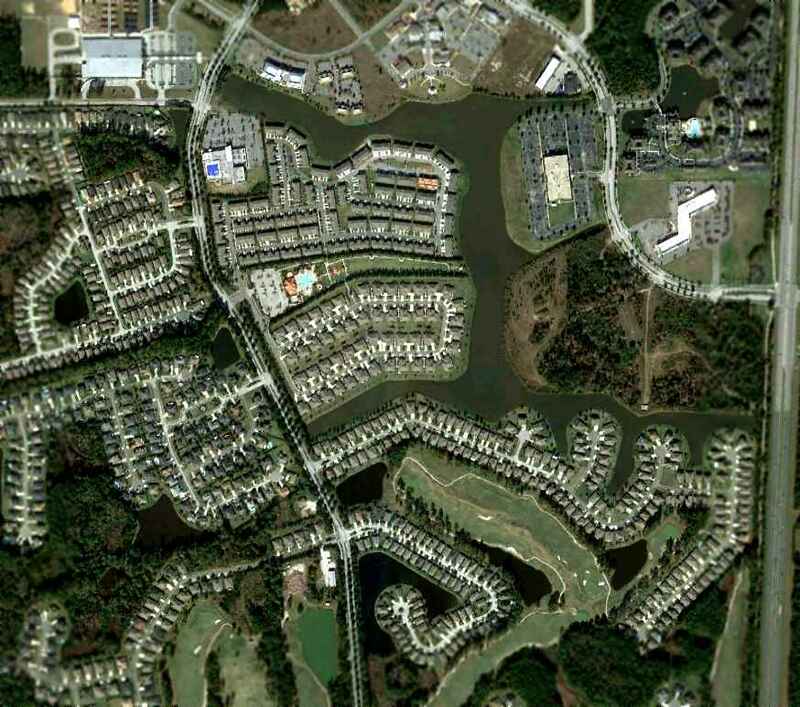 The date of construction of Fleming's Island NOLF has not been determined. Fleming's Island NOLF was not yet depicted on the June 1942 17M Regional Aeronautical Chart (courtesy of Chris Kennedy). The earliest depiction which has been located of Fleming's Island NOLF was a 7/14/42 USN aerial view (from the National Archives, courtesy of Brian Rehwinkel). 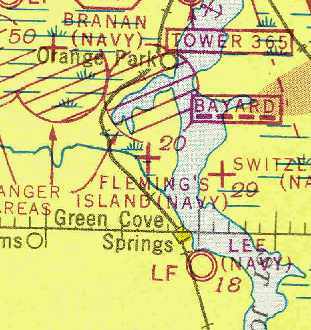 It depicted Fleming's Island NOLF in its original configuration, built to support primary flight training, with an irregularly-shaped grass airfield, with an airfield circle marking in the center. There were no buildings visible on the airfield, or any other improvements. 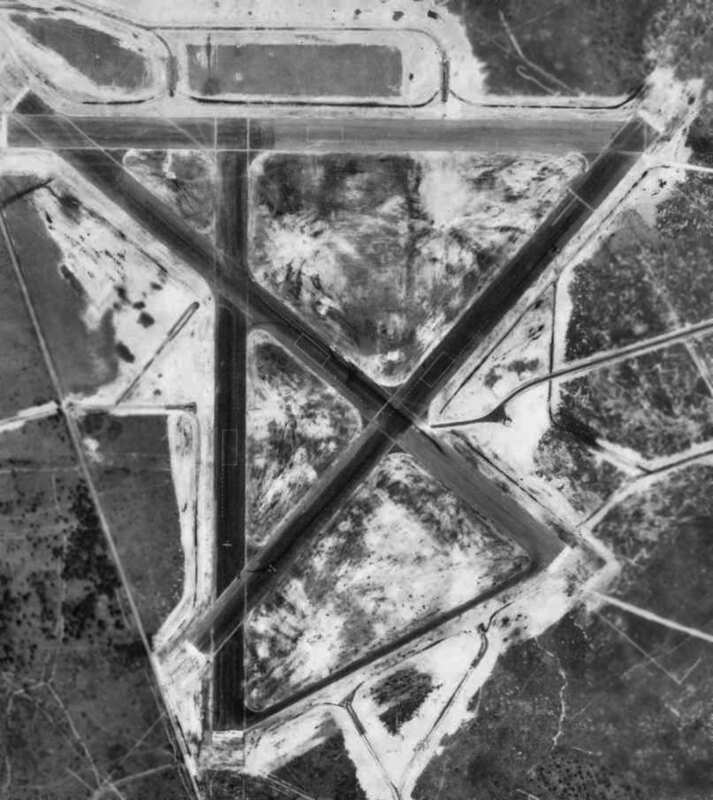 At some point between 1942-43, Fleming's Island NOLF was completely transformed into its “2nd generation” configuration, with 4 paved runways. 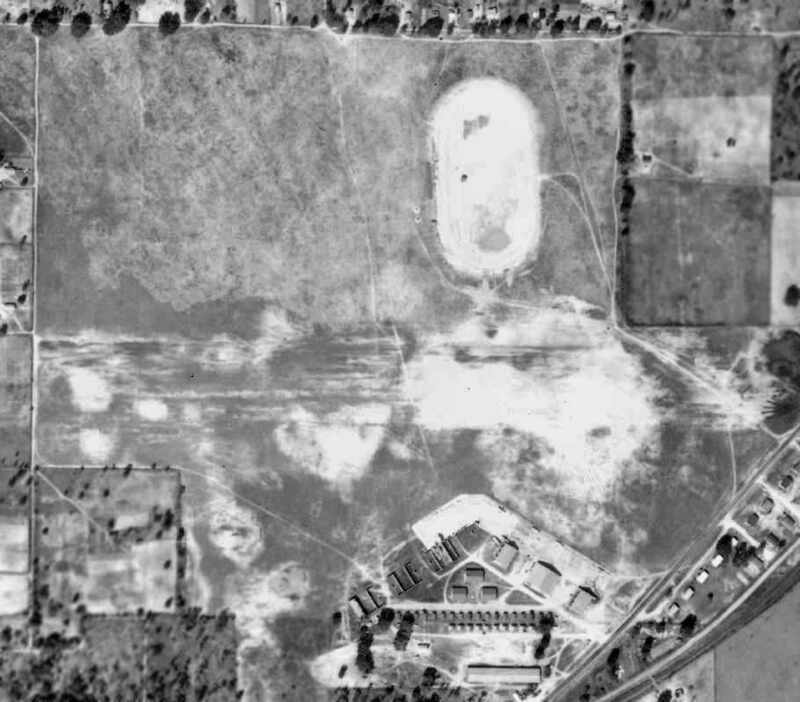 According to Brian Rehwinkel, the “airfield was completely changed when the mission of NAS Jacksonville shifted away from primary training in 1942.
was a 5/28/43 USDA aerial view (courtesy of Dallam Oliver-Lee). It depicted Fleming's Island as having 4 asphalt runways, and 2 single-engine aircraft were visible on the runways. was a June 1943 US Government aerial view (courtesy of FL DOT, via Brian Rehwinkel). 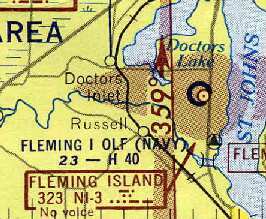 It depicted “Fleming's Island (Navy)” as an auxiliary airfield. showing the newly-added Field Carrier Landing Practice 'runway' (the white rectangle just west of the northeast/southwest runway). showing the Field Carrier Landing Practice 'runway', with arrestor gear. depicted "Flemings Island (Navy)" as having a 4,000' hard-surface runway. but there was no sign of recent aviation usage. depicted "Fleming I OLF (Navy)" as having a 4,000' hard-surface runway. It also depicted that the airfield had its own NDB navigational beacon - very unusual for a satellite airfield. However, the remarks in the Aerodromes table said "Closed." 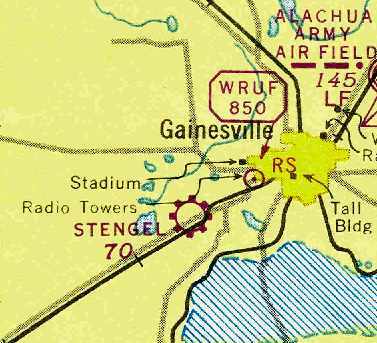 Fleming Island was labeled "Abandoned airport" on the 1964 Jacksonville Sectional Chart (courtesy of John Voss). As of 1965 the northern runway was being reused for drag racing, known as Thunderbolt Dragway. Drag racing historian Bret Kepner confirms that "Thunderbolt Dragway was located on the property of the abandoned Fleming Island NOLF. on the NOLF before it was decommissioned." Chris Alvarez recalled visiting the Flemmings Island airfield in 1974. "The field was approximately a half mile down an overgrown road into the pine woods. I knew it then as 'Thunderbolt Speedway'. But by 1974 it was not being used & the paved runways had pretty much disintegrated." was used to film the airstrip portion of a TV movie called 'The Road Raiders'. It was set in the Philippines in 1942 & was about a band of left-behinds using the hulks of aircraft & trucks to carry on the fight. They had a P-37 fuselage mounted on a truck chassis. I remember they flew a P-51 into the strip & parked it along one of the runways. 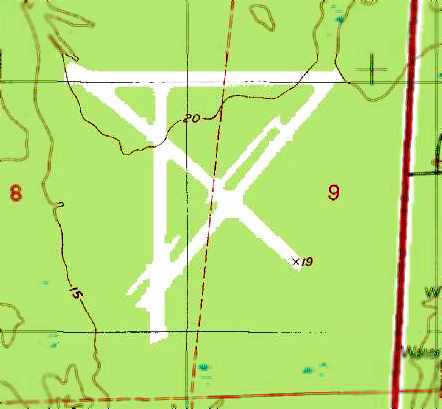 The 1992 USGS topo map still depicted the outline of the 4 former runways, but the site was unlabeled. having seen 'abandoned airfield' marked on some older maps. The paving was still there, the old start/finish lines were still there. The big construction project started the next year. 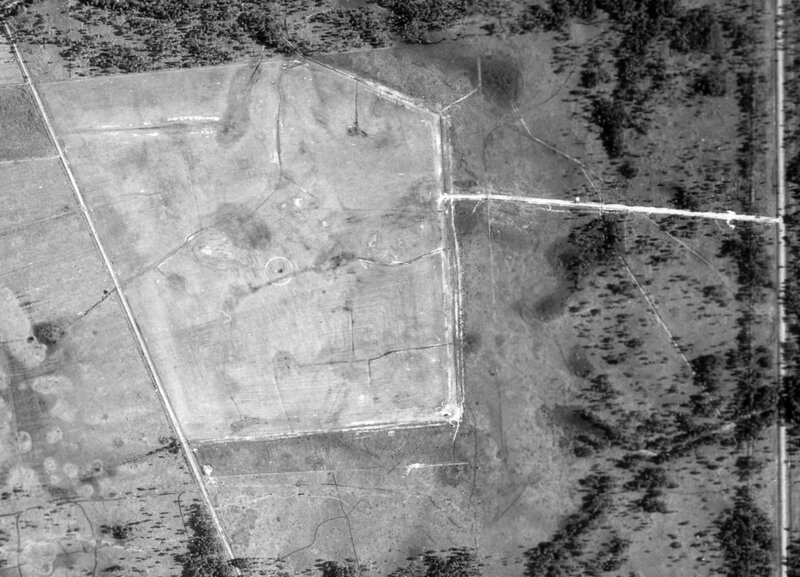 The last photo which has been located showing the Fleming Island airfield was a 1/7/99 USGS aerial view (courtesy of Dallam Oliver-Lee). and even the finish line is still clearly defined." I was greeted by one of the largest construction projects I've yet seen. The entire area... had been plowed & crews were simultaneously building malls, housing, and schools in the area. Incredibly, an elementary school built on the site has been named Thunderbolt Elementary in honor of the dragstrip." with the site covered by housing & a new lake. 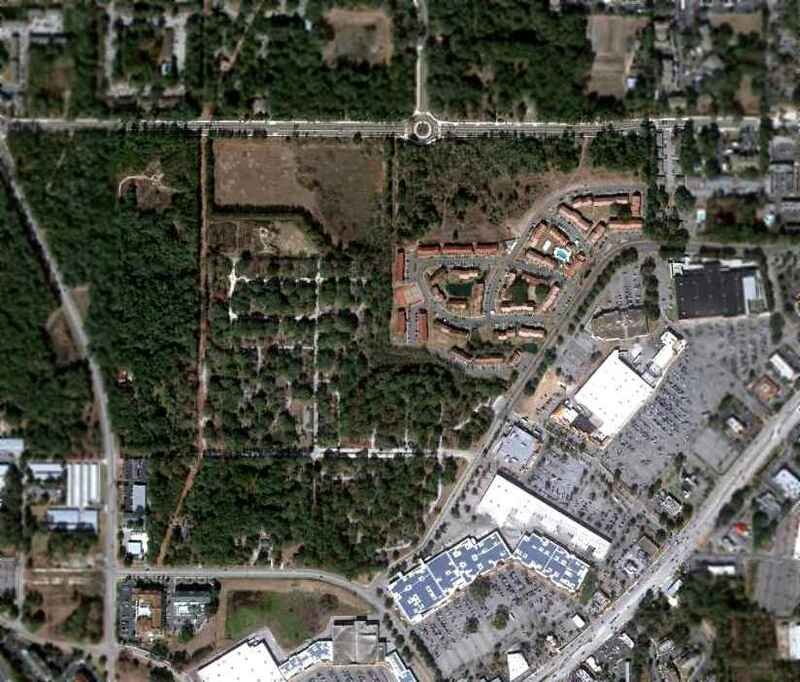 A 12/17/11 aerial photo (courtesy of Dallam Oliver-Lee) showed no recognizable trace of Fleming Island NOLF. approximately 10 miles South of Jacksonville Naval Air Station.